appears to be coming through the bone. The brass liners and pins look good and the bone is in good shape, I'm at a loss on this one. Knife is a Case 54 pattern made in the 80's. Re: Bone Handles Discolored ? Dimitri had a similar problem with an ivory handled quill knife he posted recently. Verdigris was forming on the brass liners and leaching into the handles from the bottom. Not sure how to cure the problem or clean it.Possibly immersing it in a solution of baking soda and water might clean it but I don't know if it would take out the staining in the bone.After soaking you could blow it dry with compressed air. Bleach might work but it might damage the bone. By any chance was it a leather roll? The reason I ask is because when I've seen verdigris it's been a combination of brass and leather in proximity to the knife. Another reason I do not store knives long term in rolls of any kind. Learned the hard way! Mumbleypeg wrote: Another reason I do not store knives long term in rolls of any kind. Not even those cotton silverware rolls? The kind actually made for silverware but people use them for knives. Like me. The only cleaning I've done was with simichrome, it just made it shine! I am hesitant to try anything more aggressive. It doesn't appear to be eating away at the bone like I've seen on stag. It was stored in a Hickory knife roll and none of the other knives seemed to have any issue's. I was in the process of moving knives to folders when I found this, I should have done it sooner! Mike, I have no experience with silverware rolls. I've not tried them. They may be okay. Due to bad experiences with other types, I've found alternate storage. Other than Sackups, I'm done with rolls. 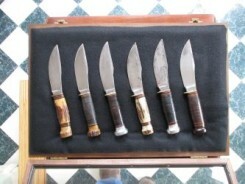 Except for transporting knives from place to place, like to and from a show (which I don't do much of any more). I just don't trust what harmful content knife rolls may contain - chemicals, dyes and so on used in their manufacture may outgas over time. I've had knives damaged by leather and elastic materials in knife rolls. I do use and endorse Sackups. I've used them for years for knives and firearms without a single problem. But I guess I don't think of them as conventional "rolls". Sorry I can't say the same for others. As I said, learned the hard way and it's a hard lesson when you open that roll and find your knives damaged. I have another theory about that discoloration. I have mentioned on here before about oil seeping into bone. Natural bone, Mediterranean blue bone and antique bone all from Case have discolored from the lubricating oil I was using. Usually it just makes the bone darker in areas. I haven’t seen what it does over time. I wonder if that could be part of the problem? Was the knife roll green on the inside by any chance? I wonder if color leached out of the roll because of the oil? This was stored in a knife roll. Parker knife USA made. with something in the fabric and would show up on light color bone. I think from now on I'll just use Ren wax on light colored handles. How do you like the other side? Mumbleypeg wrote: Mike, I have no experience with silverware rolls. I've not tried them. They may be okay. How do you like the other side?"